I am writing to inform you about an upcoming Program at the ICCNY and to Welcome our new Imam, Nour Adeen, who has come to us from Azhar University in Egypt. Please see attached schedule of events. 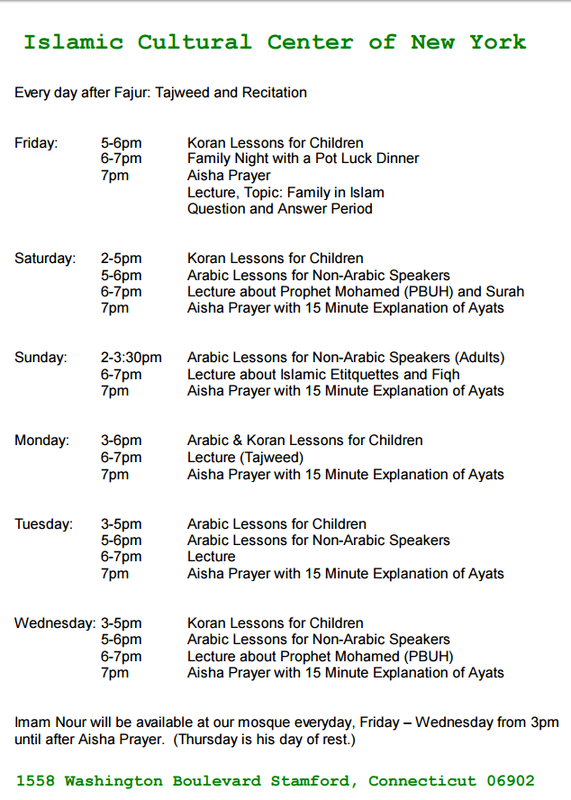 We hope you all will join us in giving Imam Nour a hearty welcome and participate in his classes and seminars. 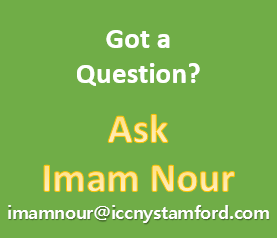 I am writing to inform you about an upcoming event at the ICCNY and to welcome our new Imam Nour Adeen who is coming from Azhar. Day of Ashurah, the 10th day of the Islamic New Year. Please bring a dish for 4-6 people to share. يكفر السنة الماضية لقول النبي صلى الله عليه وسلم : ” صِيَامُ يَوْمِ عَرَفَةَ أَحْتَسِبُ عَلَى اللَّهِ أَنْ يُكَفِّرَ السَّنَةَ الَّتِي قَبْلَهُ وَالسَّنَةَ الَّتِي بَعْدَهُ وَصِيَامُ يَوْمِ عَاشُورَاءَ أَحْتَسِبُ عَلَى اللَّهِ أَنْ يُكَفِّرَ السَّنَةَ الَّتِي قَبْلَهُ ” رواه مسلم 1162. وهذا من فضل الله علينا أن أعطانا بصيام يوم واحد تكفير ذنوب سنة كاملة والله ذو الفضل العظيم . When our Prophet Mohamed ( PBUH) went to Medinah, he saw that people were fasting on this day and he asked them what was the purpose of their fast? The people said it was because God had saved Prophet Moses from the Egyptian Pharoah. Prophet Mohamed (PBUH) said “then I too will fast this day for Prophet Moses”. It is known that God will forgive your sins of the past year for fasting on this one day of Ashurah. May God forgive us our sins and and guide as in right path. Ameen. Hope everyone had a great summer and are doing well. Alhamdullilah, we are about to start the Sunday School for year 2016-17. Registrations on Sept 10th (Saturday) and first day of school on Sept 18th (Sunday). Br. Amr Badr has been appointed as School Principal (interim). We wish him along with the team of teachers/volunteers and all the students a great year of Islamic learning & fun Insha Allah. 1. 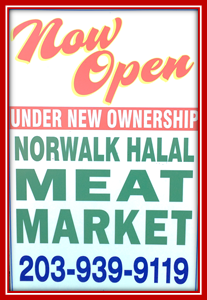 Registration will be on Sept 10th (Saturday) between 10:30 a.m. to 1:00 p.m.
8. School timings will be 10:15 a.m. to 1:00 p.m.
We start with limited capacity of students for each level – 1 to 6. School administration will confirm the enrollment based on available spots in each level. Students will be put on Waiting List if all spots for that respective level has been filled. More spots will be opened based on availability of required teachers. Lastly, as much as Sunday school is important, we would like to stress the need for Parent’s involvement with Students at home to ensure effective learning. 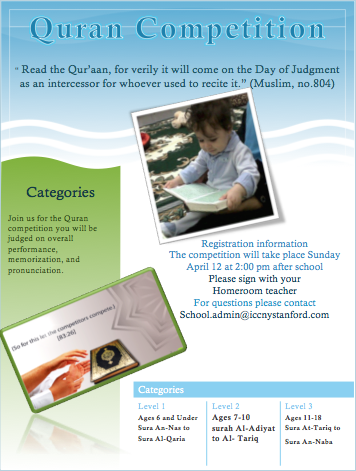 The program will focus on teaching the Arabic language in a practical way using the daily Quranic verses that we recite in our daily prayers. The instructor will use the (Practice on real-life example/Repeat) method to bring non-Arabic speakers up to speed with the language. Knowing the meaning and how to use every single word in the Quranic verse will build a repository of words that the speaker will be able to understand when he or she hears them, and will be able to use the repository of words in conversations with Arabic speakers.